Driving Under the Influence is a serious offense under Florida law. Florida statute 316.193 and 316.193(1) create serious penalties for those convicted of Driving Under the Influence. What does a Driving Under the Influence stop look like? So, what does it take to get stopped by the police for DUI? Not a lot. For example, one night you are driving home from a South Beach Club. Suddenly, you catch the interest of a police officer. Maybe you moved over the center line, did not use your turn signal, driving a little too fast, it can be anything. Next thing you know, the red and blue lights are going off behind you, you pull to the curb and await the officer to appear at your window. Once the officer smells alcohol, the officer is going to ask you to step out of the car. You are nervous, you had a couple of beers, but you are not drunk. Are you Driving Under the Influence? The next thing you know, you are standing on the side of the causeway, doing some goofy test that is supposed to tell the officer if you are impaired. At about this time, you are scared and worried. Are you going to be arrested? Who is going to let your dog out? All kinds of things run through your mind. Now the officer grabs your hand and says that phrase nobody wants to hear, “You are under arrest for Driving Under the Influence.” DUI stops happen every night, all night throughout South Florida. There are police officers that do nothing but look for DUI drivers. Tens of thousands of people are arrested every year in Florida for Driving Under the Influence of alcohol or drugs. A DUI conviction can wreak havoc in your life. Worse yet, your job, insurance rates, driver’s license suspensions, impound fees, and not to mention legal fees are all problems you are going to have to deal with if arrested for DUI. The most important thing you can do in your life at this point is to hire a great DUI lawyer, like me! 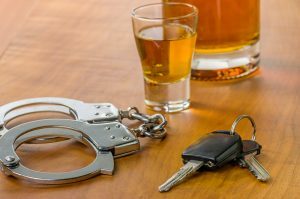 So, what does it take to get arrested for DUI in Florida? Well under Florida statute 316.193(1), if you have a blood alcohol content over .08%, are under the influence of a chemical substance, and you are driving or have physical control of a vehicle, you are going to be spending the night in jail. What does it mean to be in actual physical control of a car as opposed to driving? If you have the keys to a vehicle on or about your person you are in actual physical control. Should you take a DUI breath test? Click here to find out. What happens if you are convicted of a first time DUI? If your blood alcohol content is under .15%, you are looking at up to 6 months in jail, a $500.00 to $1,000.00 fine, 50 community service hours, up to a year of probation, vehicle impoundment, and vehicle immobilization. If that is not enough, you are going to have your driver’s license suspended. That is the minimum, for subsequent convictions, the penalties are a lot more severe. Cause an accident, injure or kill someone and the penalties go way up. Get a third DUI within ten years, or more, you are up to felony level DUI. Our Blog contains several informative articles on traffic-related crimes.